Sometimes, something awesome, isn't awesome. The L'Oreal Miss Candy collection was pretty awesome. Jellies are awesome, but not all jellies were created equal in this collection. This is the sad case with Berry Nice. A great idea, but a not a great result. Berry Nice is a violet jelly. 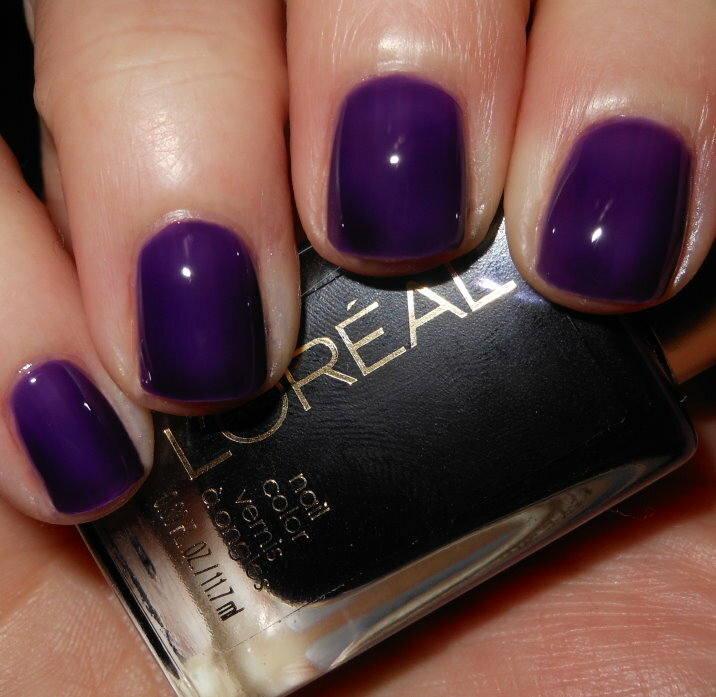 Color: No doubt about it, this color is great. A juicy grape popsicle color is hard to beat in my book. Too bad the formula didn't match the greatness of this color. Formula: The above swatch is wait for it...5 coats. Five coats, and it is still patchy, uneven, and streaky. Nouveau Cheap nailed it on the head in her review when she mentioned that the purple pigment is the issue here. The polish formula itself is not bad, it's really the pigment that is not dispersing evenly in the formula. I have also noticed this with other purples (i.e. China Glaze Creative Fantasy). Price: I believe I paid around $5-$6 for this at Walgreens. Overall: This is disappointing. This is such a beautiful color, but the pigment/formula issues make this not worth it in my book. This makes me sad. Womp womp. That is a shame, it's such a pretty color! It's a shame because I actually thought the colour was really nice and it's a good surprise from how it looks in the bottle but 5 coats is just totally pushing it. Linda .. divina essa cor! sad this one wasn't great. but it'll be good for a jelly gradient? I don't seem to have this problem with my bottle of Berry Nice. I'm sorry to hear that you do. It really is such a gorgeous shade. Thanks for the tip. I was really considering this one since it is such a gorgeous color. I only ended up with the Red and the lilac Coolers one. Which one was your fave of this collection? Too bad about the formula, though it doesn't really show that much in your picture!